Along 25 Oktober Avenue a large sign proclaims 17 years! This will have changed to 18 now. 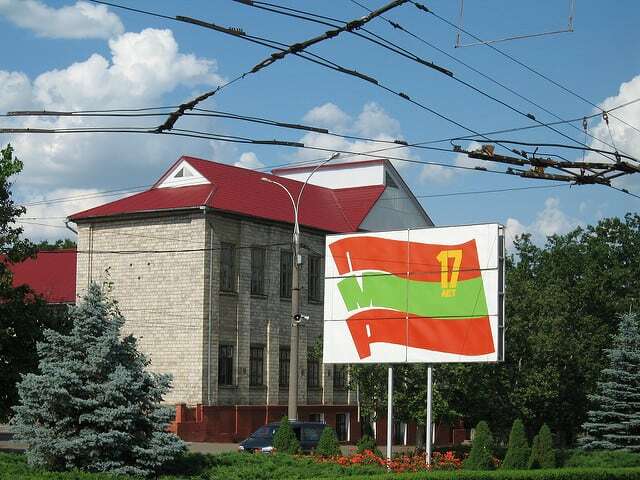 That’s how old Pridnestrovian Moldavian Republic, better known as Transnistria or Transdniestr, is. Wedged between Ukraine and Moldova, it’s a breakaway republic, still adhering to a Soviet system. This is a different world; a living museum of times gone by. Each year, I aim to do a “mum with just one daughter”-trip. This way, each girl will get all the attention for a few days. I’m drawn to the world’s more obscure places. 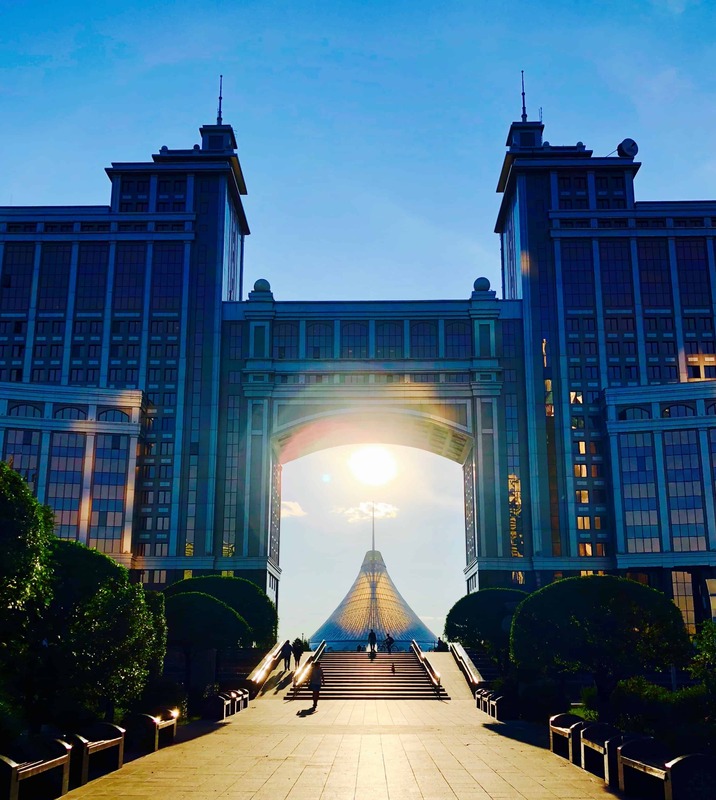 An much as Alex, my oldest, might have preferred shopping in London for the umpteenth time, we’re in Moldova instead, to explore its chic capital Chisinau, the archaeological finds at Orheiul Vechi and, most importantly, to have a look at the non-existent country Transdniestr. 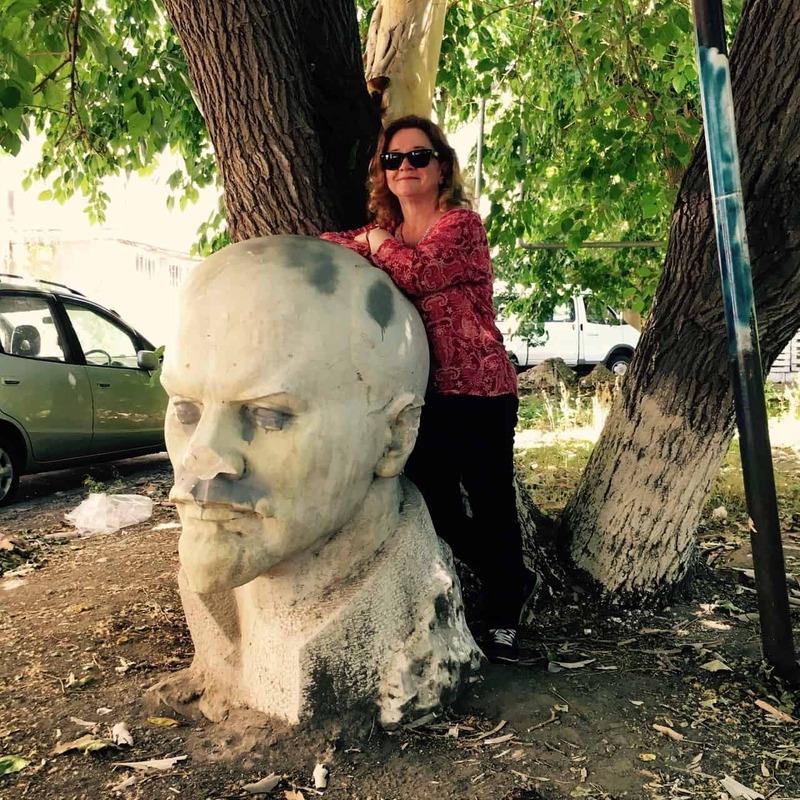 We walk through the wide leafy avenues of capital city Tiraspol with our new Transdniestrian friend Anya, passing by imposing buildings, monuments, memorials and pretty riverbanks. Tiraspol is very green. And very clean. Not a scrap of paper anywhere. No rubbish dumped haphazardly about. We’re told street sweepers are highly valued. Earning as much as university graduates, the sweepers are also given an apartment after 10 years of service. Outside the government building, we bump into Vladimir Ilyich Uljanov, better known as Lenin. In most Eastern European countries, remnants of the Soviet past have been eradicated or relegated to slightly satiric monument parks. Not here. In 1989, the Moldovan parliament enacted several laws which led people to believe a union with Romania was forthcoming. Not us, said the 700 000 mainly Russian-speaking residents of the region Transdniestr. On 2 September 1990, this little strip of land on the east bank of the river Dniestr, declared its independence from Moldova. Soon after, a war ensued. 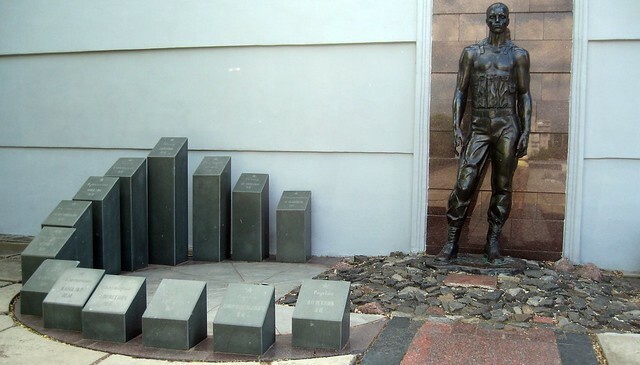 In Tiraspol, its casualties are remembered next to the victims of World War II and the Soviet campaign in Afghanistan. Anya shows me her passport. It is written in 3 languages: Russian, Ukrainian and Moldovan, all in Cyrillic script. It’s not very useful outside the republic, though. 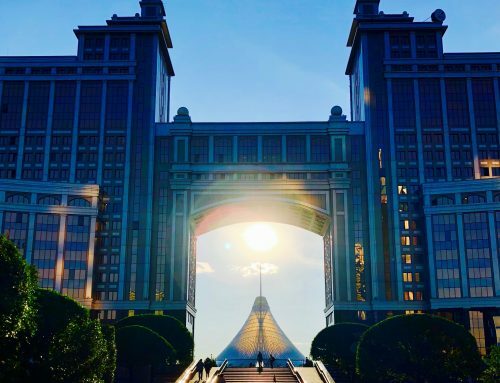 As Transdniestr is internationally unrecognized, the citizens need a Moldovan passport for travel outside the country. The self-declared, break-away republic doesn’t officially exist. Not being recognized by the international community doesn’t seem to be a deterrent. In addition to the passport, this little republic has its own national anthem, flag, coat-of-arms, currency, postage stamps, a constitution, parliament, government, police force and borders. The border police are notoriously crooked. Or so the rumour goes. Mentally prepared for an unpleasant experience, I handed over our passports when we entered. The whole thing took just a few minutes, and was surprisingly trouble-free. So that was it, then? No harassing? No euros, dollars or Moldovan lei discreetly slid across a desk? Not so much as a menacing stare but rather a “welcome in Transdniestr”? Perhaps we just got lucky. We head for the Russian Orthodox Pokrovskaya church, built only 10 years ago to replace a much smaller one. A revival of religion, perhaps? 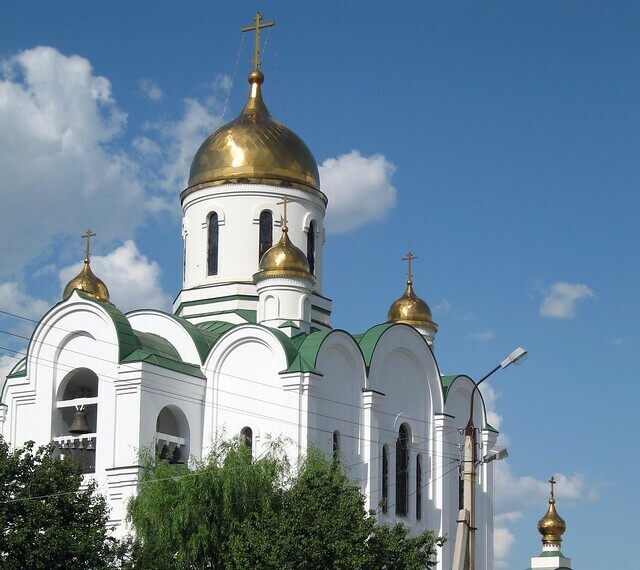 White and with shining golden domes, Pokrovskaya is pleasantly cool and quiet inside. The intoxicating scent of incense pervades the air. Then a more secular stop: Sheriff is a shop selling football supporter gear for Team Sheriff. Hm. Didn’t I see a Sheriff petrol station out by Bendery near the border? And a Sheriff super market? Also, didn’t we drive past Sheriff Stadium? A name worth noting, it seems. Some claim Sheriff is run by Transdniestrian president Igor Smirnov. Some also claim it’s a cover for money-laundering. Outside Dom Soviet (Parliament), another bust of Lenin resides on a pedestal. 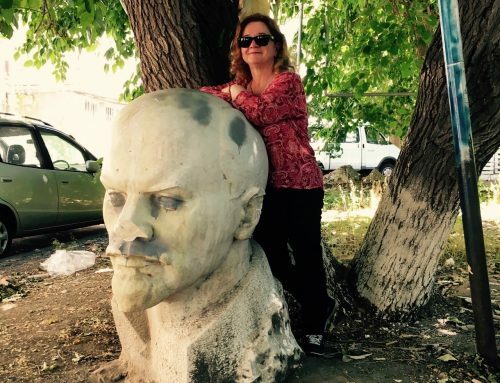 In front of the Transdniestrian parliament, and elsewhere in town, Lenin still reigns supreme. Nearby, an outdoor photo gallery exhibits the annually elected “Best people of Tiraspol”, including a local doctor, a school teacher, a policeman and about 10 others. I ask who elects the “best people”. Anya assumes it’s the administration. No SMS-voting here, then. Probably easier that way. 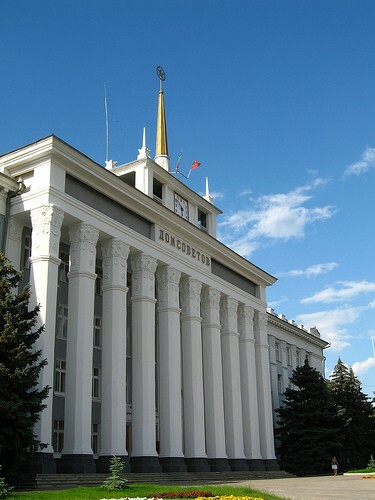 On the opposite side, another gallery shows a more permanent collection of fine, upstanding Tiraspol citizens; a “best people through the ages”. Military uniforms are prominently present. 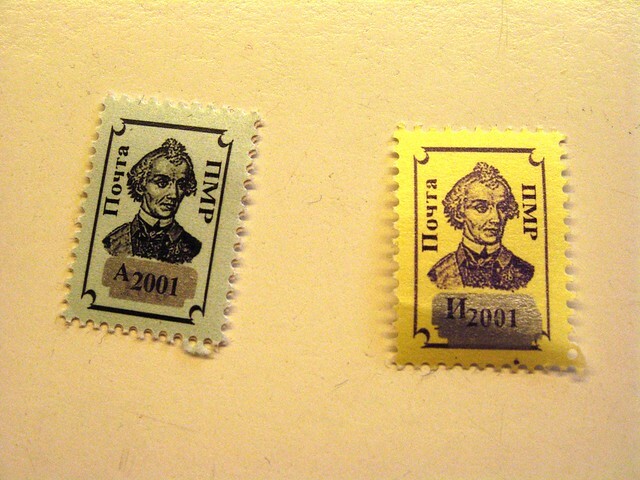 And President Smirnov. 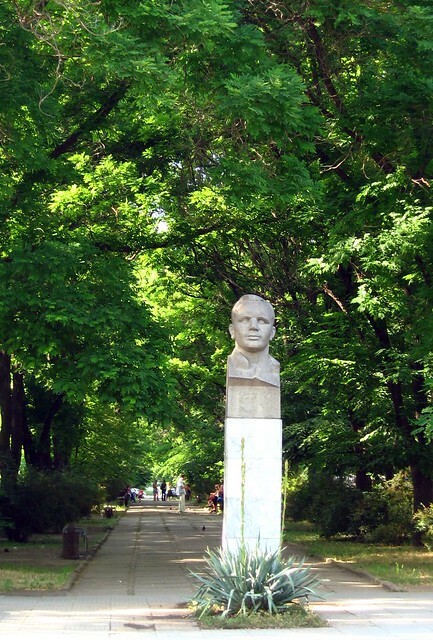 We continue past the children’s cultural centre, the theatre, the university and a statue commemorating first man in space Yuri Gagarin. Then Dom Knigi, an entire block devoted to books! Or rather, it was. I like the name Dom Knigi (meaning House of Books). Always have, ever since I first saw the words on a huge book shop in what was once Leningrad. A love of literature seems to have pervaded the Soviet Union. Everyone read books; even forbidden ones. I remember discussing Tolstoy and Ibsen with a total stranger on a freezing wintry street back then. French was our common language. Today, even Transdniestrian kids would rather play Nintendo. And while the Dom Knigi still exists, it has been reduced to ¼ of its original size. But inside, it’s wonderfully old, with dusty volumes on shelves behind counters. Yuri Gagarin, the world’s first man in space, is cherished as well. Time for dinner and we need cash. Everything is paid in Transdniestrian roubles. While changing money, Anya tells us little Tiraspol has 7 banks! Somewhat ironically, saving is not easy, especially for families. With an average monthly salary of 200 – 250 USD, a university graduate has very little left after paying for food, clothing, rent and school. In theory, school is free. But books and uniforms cost. Parents are also responsible for renovating and maintaining school buildings. At the restaurant, none of the young smiling waitresses speak any English. It is possible then, to live in 21st century Europe – and not speak English. I find that oddly endearing. That said, I’m glad we have Anya with us. I’m not quite sure how we would have managed without her. Savoury pancakes filled with cheese and smothered in sour cream are delicious. And chicken fillet stuffed with mushroom and wrapped in eggs. All is incredibly cheap; the equivalent of a few dollars for all of us. Yet again, I’m reminded of travelling in the old eastern block. Particularly DDR, where beer was so inexpensive, you could stay drunk for days on the 25 Deutsche Mark you were required to exchange when crossing into East Berlin. We stay overnight in Evgeniya’s apartment. She’s a pleasant middle-aged woman with a spare room. Evgeniya speaks only Russian. We, sadly, do not. 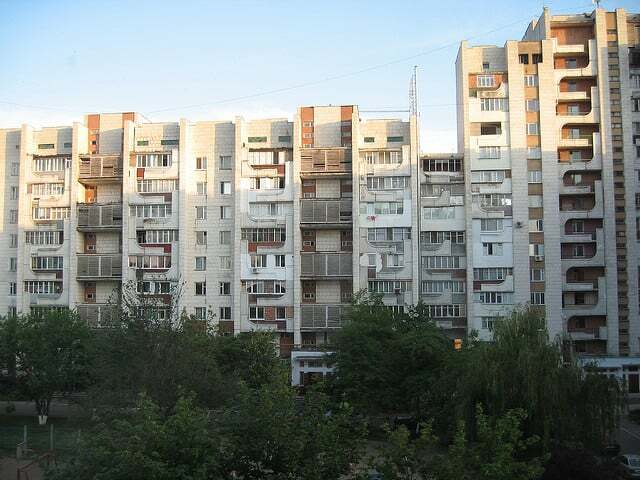 Centrally located in downtown Tiraspol, her apartment is in a worn concrete block of flats. Outside, on this warm June evening, children play while babushkas knit and chat. Around midnight, we drift off to sleep to the sound of laughter and the scent of flowers wafting in through the open windows. The former Soviet Union fascinates me. I guess it is because my first ever trip was to Estonia. There is something intriguing about the communist era. 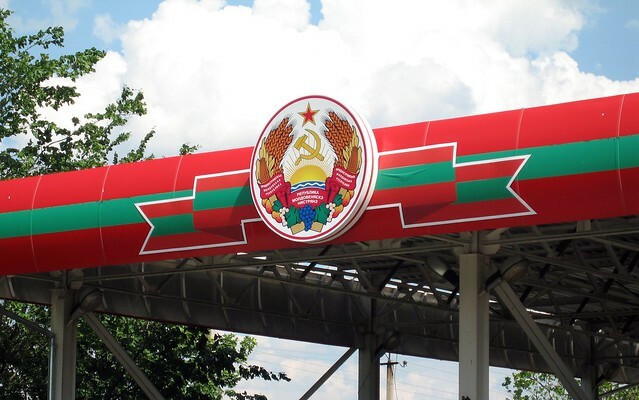 Would like to visit Moldova one and see more of the the former USSR. Never heard of this country either, I can’t even pronounce it actually! 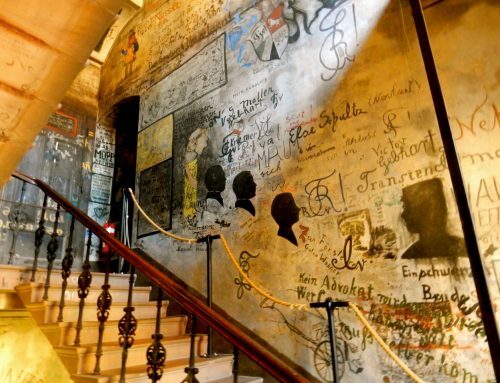 Very fascinating, we never know how many of these obscure places are in the world, I too love discovering them. Now I have that song in my head! Sounds like an interesting place, and like Raymond… I’ve never heard of it! Wow! If I didn’t know you, Sophie, I’d think this was all made up. A Great April Fool’s joke. Leave it to you to visit a place that isn’t there. I’m still trying to rack my brains to figure out where that place is!! i love that you have one daughter per trip!! what a wonderful bonding experience filled with such memories! I had never heard of this country before! The old Soviet countries are so interesting though. I have been to the Ukraine before an it was a beautiful place! @James – In the Ukraine, I’ve only been to Kiev – so interesting and beautiful. I love that you do a vacation with just one of them, its things like that they will remember forever. It’s great that you’re showing your children the world and by taking one of them at a time it’ll really make it a special experience. Like the majority here, I have never heard of Transdniestr. Sounds like a fascinating find in a part of the world that is largely ignored by travelers. Love the one daughter trip idea. I don’t know whether i find this little country, whose name I’m pretty sure I can’t pronounce, chilling or hilarious. Don’t they watch TV??? Read the papers?? I’ve been here 4 years ago, this really something different! It’s like being in a museum or being in a history book, a great experience! As opposed to you, we’ve been asked to pay at the border, but we refused and they let us go, same thing on the way back. They were not particularly annoying about it, just trying. I’m sure a lot of people would pay since it’s quite impressive to see all these soldiers 🙂 Loved your article!